Since my last update, I’m proud to say that I’ve completed my course! The major components of the second half of this course concerned Storage and Database implementations. Here’s a brief rundown. 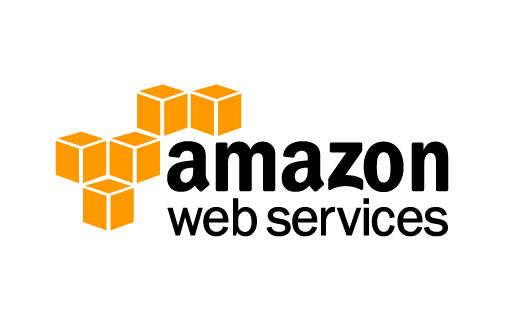 How is Storage handled on AWS? The main storage offering on AWS is called S3. This is basically bulk storage in AWS offered for a flat fee based on usage. If you’d rather use a dynamic and shared storage that auto-scales, you’d set up a resource in Elastic File System. The platform offers several different configurations based on availablity and performance expectations. Versioning and replication of containers is supported. Short and long term backups are covered by Glacier. This is long term storage of snapshots of data at a lower fee, but binds you to a time commitment. Those of us that have Disaster Recovery responsibilities can use this to implement Father->Grandfather backup strategies. How are Databases implemented in AWS? The conventional implementation of databases is by provisioning virtual DB instances. You can choose your preferred framework, like MS-SQL or Oracle and then select the tier you need within that framework. For the NoSQL crowd, there’s Dynamo DB which offers low latency databases for high traffic services and data analysis tools. Certification note: The exam is mentioned by the course as being very heavy on Dynamo DB. Calculating performance is a prominent item on the cert as you have a lot of fine tuning control with access. The key is to find that sweet spot where your bandwidth is sufficient without over provisioning. Simple Queue Service + Simple Notification Service – Used as a clearinghouse to trigger shared events throughout your environments. Simple Workflow Service – Used for management of back end processing in your API or Service Layer. Cloud Formation – A framework for creating templates that provision predetermined purpose-built sets of AWS resources. Elastic Beanstalk – Basically a wizard for provisioning auto-scaling application hosting environments that are immediately ready to run code. Shared Responsibility Model – An overview of the demarcations between what integrity concerns the customer is responsible for as well as AWS. Route 53 – More of an actual overview of DNS architecture rather than anything special about its AWS implementation. Virtual Private Cloud (VPC) – This covers configuration of public and private zones of resources and defining rules for interoperation between them. Basically, taking everything we’ve learned and pulling it all together into something useful at the enterprise level. The analogy used for this is to think of a VPC as a logical data center. Now that I’ve completed the course, it’s time to put my money where my mouth is and successfully pass the exam by the end of summer per my original commitment. Wish me luck! Why Earn Certifications? I’ll Tell You.. When I was first starting out in this field, I had a 1-year clerical vocational degree, no professional IT experience and a non-trivial stack of practical knowledge. So, how does a 20-something with this background get an interview? The answer for me was certifications. While working a temp job answering phones, I dove into a book on the CompTIA A+ certification. For those not familiar, this is a fundamentals certification dealing with PC architecture and troubleshooting. Once I earned this certification, I was able to parlay that into interviews and an eventual Field Tech position. Are certifications better than a traditional education? Again, the answer is ‘It Depends.’ While certifications are intended to ratify a candidate’s existing knowledge, discerning whether or not individuals actually have that knowledge can be tricky. This is where technical and knowledge-based interviews can be useful. In my opinion, in our current pool rife with graduate degree holders applying for entry level positions and mounting student debt, focused vocational training and certification is a solid option. And for those of us in the midst of our career paths, it’s a useful avenue to stay current and continue to demonstrate proficiency in our craft. 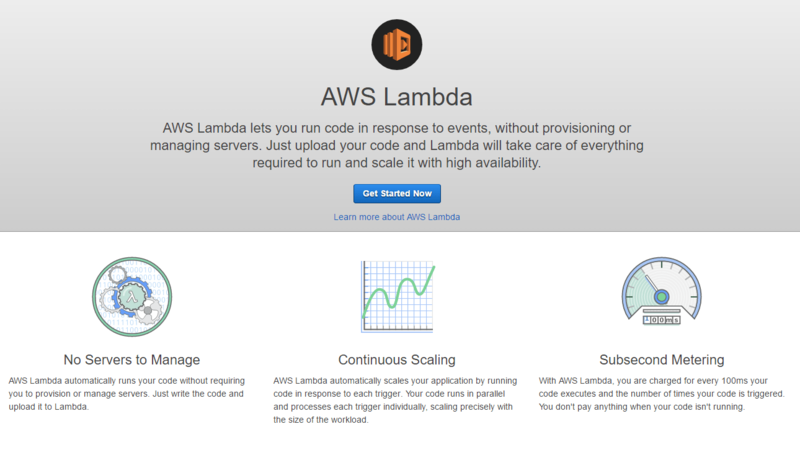 As part of an earlier post, I staged a Selenium server on Amazon’s EC2 service. Given the growing popularity of AWS, it’s something that people in our trade should take the time to become familiar and proficient with. In order to grow in this space (and take advantage of the free trial period), I also picked up the Amazon Certified Developer course from Udemy. Over the next 6 weeks, I’ll be making my way through the coursework and ultimately taking the certification. Wish me luck! I’d love to hear any feedback on this post and invite you to share your own experiences and opinions around certifications. As always, if you have any questions or comments, please feel free to add them here or address them to john@benedettitech.com. One of the questions you might ask yourself is, where can I host stuff online. My personal experience with 3-party hosting (including this blog) has been limited entirely to LAMP stack providers. While these providers are fine for general website hosting, none of them have offered an option for hosting .NET web applications. So, if I plan to build and host web content written in C# and other .NET languages, I’ll need to find a suitable provider. My goal here was to identify some low-cost providers that might be suitable for sandbox or Proof of Concept style tinkering. Basically, something that would let me experiment as an individual without breaking the bank. I’m not looking for high performance or a beefy server, just somewhere to take things out for a test spin. Some things I’ll want would be a host that supports a current .NET framework and with a DB backend (MS-SQL would be great but I could live without it). 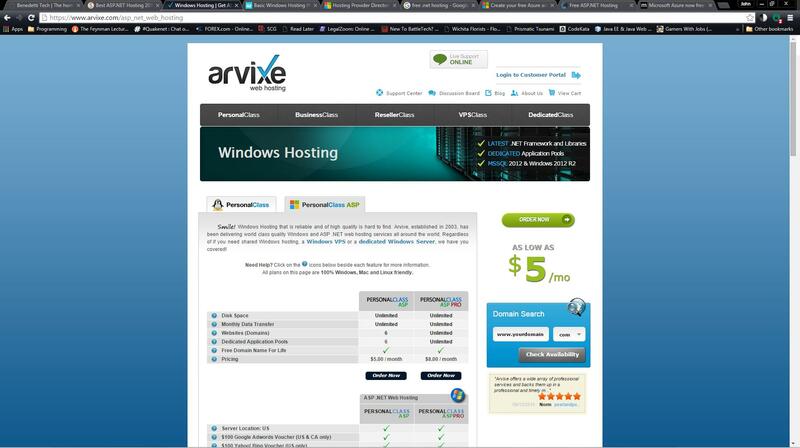 Arvixe showed up as a top contender in a couple of online reviews. After checking out their website, it looks like they offer everything that I might look for at a cost of $5/month. Certainly something worth looking into. 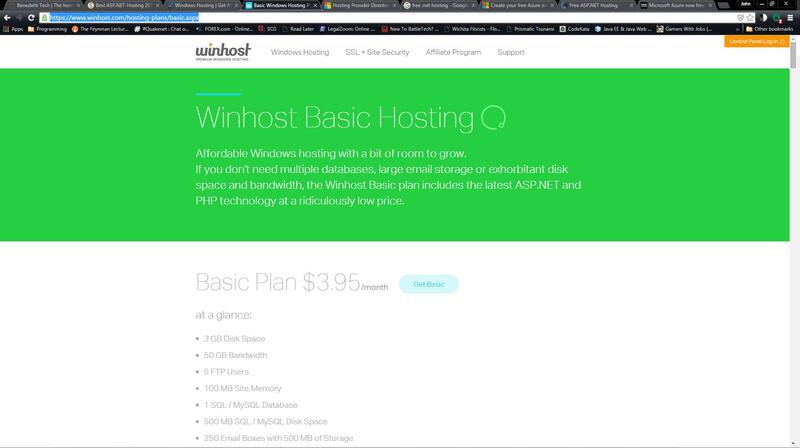 WinHost has shown up in a lot of ads for me lately so I decided to take a look at their offering. Their Basic Plan price was $3.95/month but they require a 2 year commitment in order to achieve that price. Additionally, they only offer a single site and a single DB. In order to move beyond that, I’d have to commit to their Max Plan which is $7.95/month. This is where I’ve been spending a lot of my time lately. Azure allows the customer to pick and choose all of the components that go into an environment and pay for as little or as much as you like. Individual nodes and other infrastructure can be provisioned at will and there’s an estimated monthly cost for each item as they are provisioned. While I do like the idea of paying for dedicated and infrastructure on-demand, I am a little daunted by the pricing, as even a Basic server costs $55/month by itself. 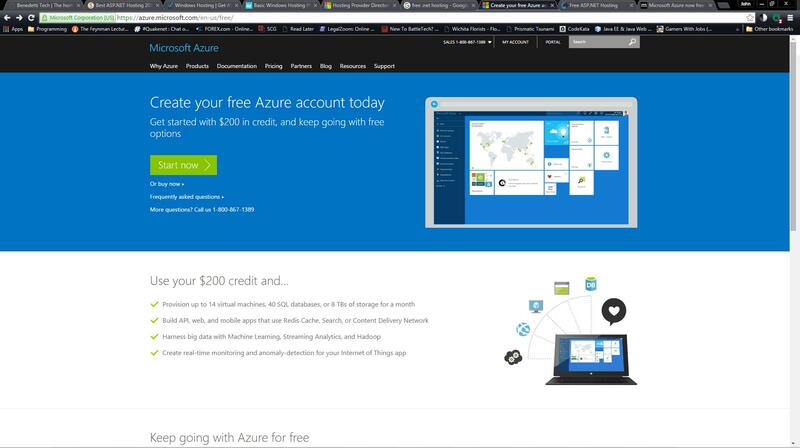 To me, the interesting thing about Azure hosting is that they offer an upfront trial ($200 credit) for any user. Additionally, you are only charged for when your resources are actually used. So, if you take a server that’s ~$50/month to run, but only run it for a fraction of the month, you might very well come in under the other options listed below. Not ideal for a commercial website that needs to be up 24/7, but might be just fine for the occasional evening of tinkering. So, I’ve opted at this time to start a trial account of Azure and see how it behaves for my purposes. I’ll post a follow up on this at the end of the trial. If any of you have ideas for .NET hosting or have any questions or comments, please feel free to add them here or address them to john@benedettitech.com.